People attempting to escape from Madison and 8th. Madison is a mess and seeing higher waters than ever. Hoboken took a big hit and Hurricane Sandy is gone with the winds settling down and people beginning a cleanup that will take some time. For State, County and local government, the issues will take more time as infrastructure here and in the region is inundated with overlapping problems. Power is going to be the bigger lasting issue as the waters recede. PSE&G is reported to believe Hoboken will be back on line by Monday. Much of the City and region is seeing electricity out. Jersey City is seeing a 75% outage and Newark is at 95%. The northern entrances have seen the water largely settled down now and cars are traveling in and out and on the viaduct at 14th Street. The County Sheriff's were directing traffic as signals are a problem in the town with only sporadic functioning. Downtown probably is a no go zone. Areas typically seeing flooding saw far more of it. Waters are receding but MSV has not verified the effectiveness of the NHSA pump. It has its own power generators and areas look to be improving but midtown west is likely going to see continuing improvements before downtown. A limited report says the pump should now be working and one person close to the NHSA wrote, "It's hard to pump it out in this condition... the river being in the City." Areas flooding in the northeast are in better shape after seeing flash flooding at the height of the storm. 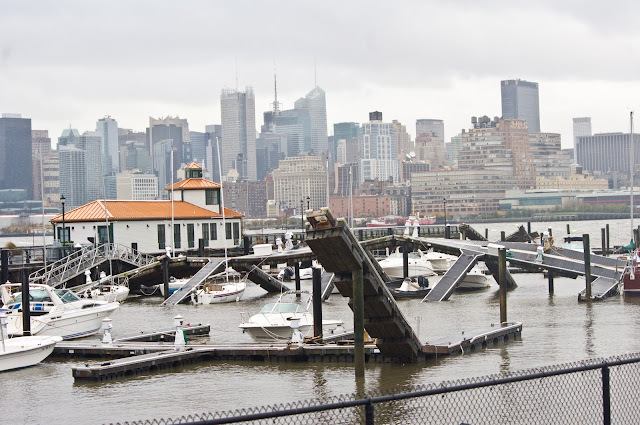 The uptown pier took a big hit. It's symbolic of the hurt Hurricane Sandy put on Hoboken and NJ. Waters are receding but areas typically flooded have even more water to contend with and will need time. It's not clear how effective the NHSA Pump is doing but it should be helping bail the flooding out. Downtown was absolutely hammered with water entering and setting record heights from First and Garden Street to all points west and north. Madison in midtown and above definitely set record highs and people in buildings there have the same option for movement as those trapped downtown. Little as public safety has limited portable boats to handle emergencies. Much of the efforts for the moment are centered on those in immediate need of shelter. Earlier the Wallace School was closed and two churches, St. Matthews being one were being used instead. Mobile service is spotty at least on AT&T. Texting is seeing better success. HUMC is closed and had been evacuated before the full brunt of the storm. Christ Hospital was the next destination but hours earlier was reported to capacity making Bayonne the next stop for medical emergencies. Mass Transit is in big trouble with heavy water problems delaying repairs for both the NYC system, NJ Transit and PATH. We're looking at weeks to get everything back online. People's patience will be tested with the alternatives which will be inadequate. Power is spotty in town. It's not clear how many have power and those that don't. Considering how others are situated, Jersey City is seeing at least 70% power out and Newark 95% down, Hoboken is faring better but throughout the region and state transformers were exploding and lighting up the night time sky based on comments by Gov. Chris Christie in a news conference late morning. MSV will be back with more when we can verify additional information. Halp, halp we're thirsty. 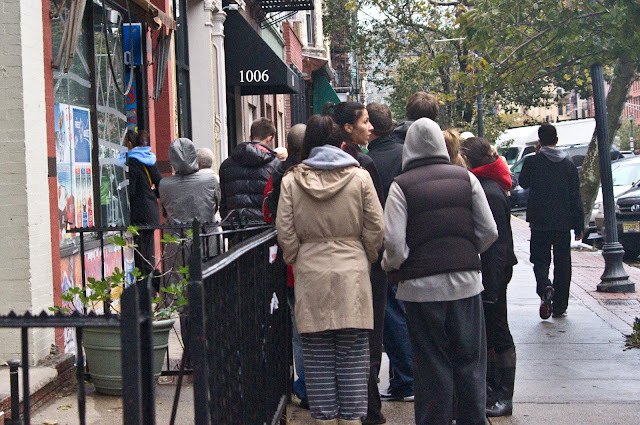 People lining up at Yash Liquor on Washington to get liquid refreshments. Talking Ed Note: Most things are closed in town. Court St. Restaurant confirmed it's opening at 6:00 pm and Yash Liquors has a line outside and is letting customers in slowly to buy drinks and liquor even though it has no working power. This is the best information we have for the moment. We'll update as is possible and try to get it 100% right because we know that's what is required as usual. Hoboken Patch has running around the clock and may be recharging. It's been Hoboken Patch and MSV hitting it with the City of Hoboken Facebook page. Hoboken Girl is urging businesses to use twitter they are open or opening via: #hobokenopen. Driving in Hoboken is not officially permitted and in Jersey City they will begin issuing summonses. If you didn't know, it's absolutely not safe to walk through flood waters. 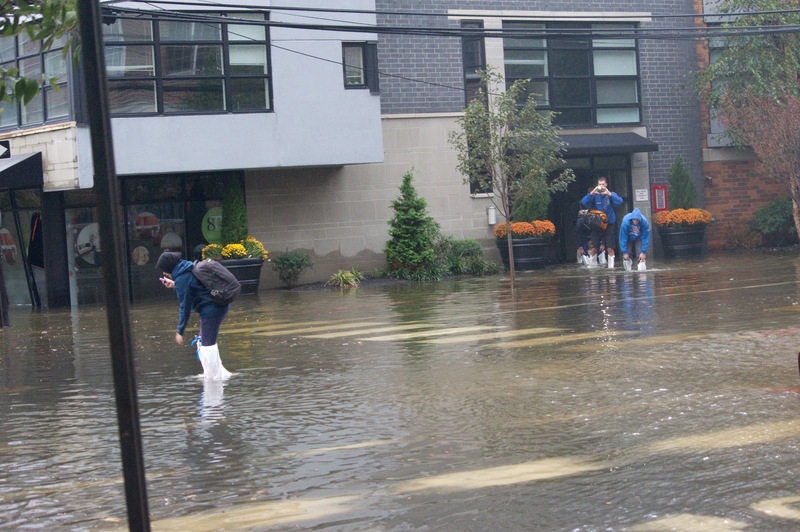 Hoboken Patch tweeted: Pillows, blankets, supplies needed at shelters at Sts Peter and Paul and St. Matthew Trinity. MSV is seeing record traffic but a lot of it is coming from outside Hoboken. That's the best indicator we have that power is out in many parts of town. Spread the word and make sure accurate information is getting around.